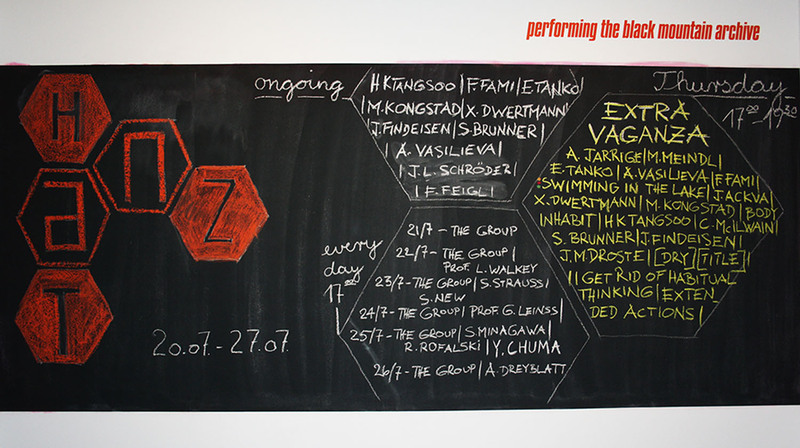 PERFORMING the Black Mountain ARCHIVE – HZT und UdK Berlin. Photo taken by Josephine Findeisen. In the framework of the project “PERFORMING the Black Mountain ARCHIVE” by artist and composer Arnold Dreyblatt, a group of students from the “Dance, Context, Choreography” program at the Hochschulübergreifendes Zentrum Tanz Berlin (HZT) in July was invited to participate in a one-week residency at the exhibition “Black Mountain. An interdisciplinary experiment 1933-57” at Hamburger Bahnhof – Museum für Gegenwart – Berlin. Black Mountain College (BMC) was an interdisciplinary art college founded in 1933 in Black Mountain, North Carolina. Teachers and students from different disciplines such as fine arts, literature, dance and theatre lived and studied together, creating a collaborative and democratic learning situation. The college dedicated itself to an experimental approach towards artistic education. For the duration of the exhibition at Hamburger Bahnhof, Arnold Dreyblatt has invited art students from different faculties to read and perform texts from the Black Mountain College Archive in the exhibition space. Departing from a given score, participants were offered the opportunity to use the exhibition as working space, to explore the archive and work on their own research to investigate the contemporary relevance of Black Mountain’s pedagogical approach. In their collectively written text, Éva Rozália Tankó, Josephine Findeisen and Xenia Taniko Dwertmann share perspectives on their experience and reflect upon the body’s potential in an exhibition context. While working with the content of the exhibition “Black Mountain. An interdisciplinary experiment 1933-57″ and the present archival material, we found our bodies equally confronted with the context itself: the exhibition space and its visitors. Coming from the field of Dance and Choreography, the residency at Hamburger Bahnhof is a question of physicality: Being a body in residency at a museum. A body at work. As dancers, our working mode is particular, since the medium we work with is movement – within, in and through(out) space. In a museum, space for movement firstly needs to be claimed. Moving bodies are nothing new in a museum. As for the visitor, a museum usually evokes a very specific body – strict physical rules are at play. The body is kept at distance to its surrounding: No fast movement, no touching, no loud sound. Being invited to work in the space of the exhibition, we could position ourselves somewhere outside the strict conditions of that space, able to inhabit it for an exploration. Architecture is a set of rules for the body to fit in. A set of strong preconditions. Architecture is a set of rules for the body to move in. To work with the space of an architecture offers impetus for movement. To use architecture as a score. In Improvising with a score, the body is both subject and object. Reflecting on the space that one moves through. Considering the significance of dance and performance at the BMC, questions about the (re)presentation of movement in the exhibition were raised. What is the difference between a dance and a document? The body’s movement only exists in a time-space. Improvisations have disappeared. We can only reference past dances through activating the scores and texts we find in the archive. At the same time the body is an archive itself, storing past experiences that become memory, and thus has an innate potential to turn memory into (a new) experience. We found various sorts of texts: letters, writings, recipes, scores and observations by individuals related to the BMC. Words written in the past inform our dance. 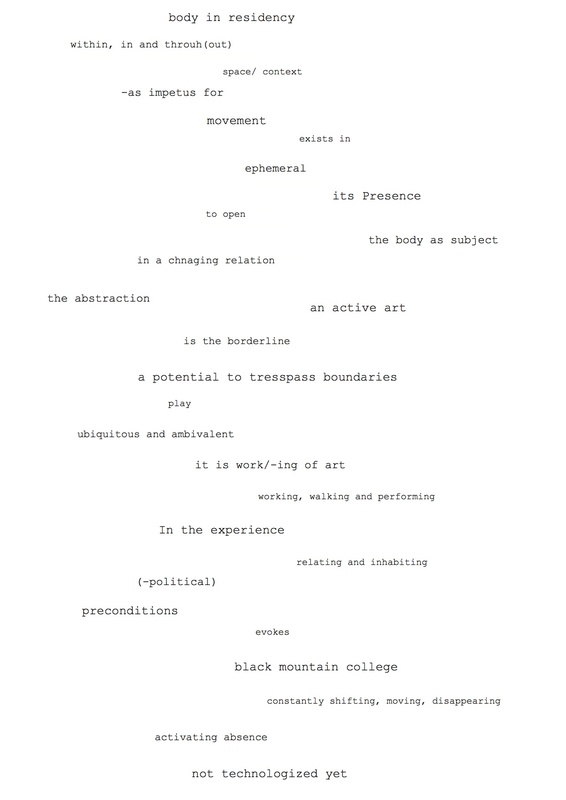 To activate a historical performance in reformulating a documentation into a score, here and now. August 26, 1951 Katherine Litz, Student Dance Demonstration. Composing texts by Cunningham, Cage and Olson into a cross-dance. The accent which in the museum usually lies on exhibited objects, moved to a process of activation of documents and bodies. Within a stillness, a dynamic network emerged between space, body and object. This is a historical exhibition. We can expose movement itself, but we cannot hold that very medium in place. When we exhibit our work, it means that the work moves. It may even move through and out of the space. Movement is ephemeral. Its presence already includes its absence. But within a space, how can movement be exhibited, while in fact it is constantly shifting and disappearing? How may it coexist as one medium amongst others like objects, sound, or documents? THE BODY’S SITUATION IN A MUSEUM. Visitors, guards and performers found themselves confronted with an artwork that is ubiquitous and ambivalent: A work(ing) of art, that is active, that moves in relation to the space and other bodies, just as the body of the visitor does too. Like the visitor moves around the exhibited art works, the dance moves around the visitor. We worked on the threshold between space, objects, and bodies: Exposing movement amongst other works of art; Being connected to the visitor through sharing a corporality; Sitting, moving, walking, performing, rehearsing, we alter between different perspectives upon the exhibition space and its architecture. Taking a position outside the rules, our bodies came to claim space and indirectly made it available for other bodies as well. The constant presence of movement confronted visitors with the notion of their own physicality. The distinction between the dancing and the watching body was challenged. Both explore how to inhabit a space and its context. It becomes a question of boundaries, and how to actively relate to them.